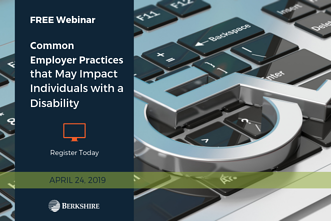 Join us on April 24, 2019, from 1 to 2 p.m. EST to learn more about common employer practices that might come under scrutiny this year. In this session, Lynn Clements, a former OFCCP and EEOC official who now serves as the Director of Regulatory Affairs at Berkshire Associates, will review what the government thinks of employer policies related to use of leaves of absence as an accommodation, attendance practices, and pregnancy-related restrictions. Register today! The webinar also will review how employers can use qualification standards and pre-screening questions without violating the ADA and Section 503. Using recent government enforcement actions as case studies, Lynn will explain what contractors can do now to make sure their employment practices are not impeding equal employment opportunity for Individuals with Disabilities. Recently, OFCCP announced it would conduct focused reviews of federal contractors’ Section 503 compliance during its Fiscal Year 2019 scheduling cycle. 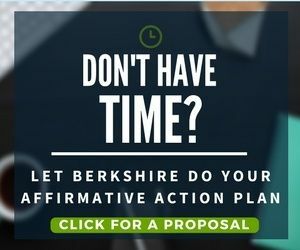 It is important for federal contractors to take the necessary steps to ensure equal employment opportunity and affirmative action for Individuals with Disabilities. Check out other topics in this webinar series.